A pergola or trellis can be a great addition to your backyard. These structures provide partial shade, while also providing support for trees and plants. Some homeowner’s even choose to adorn them with hanging plants, or swings. 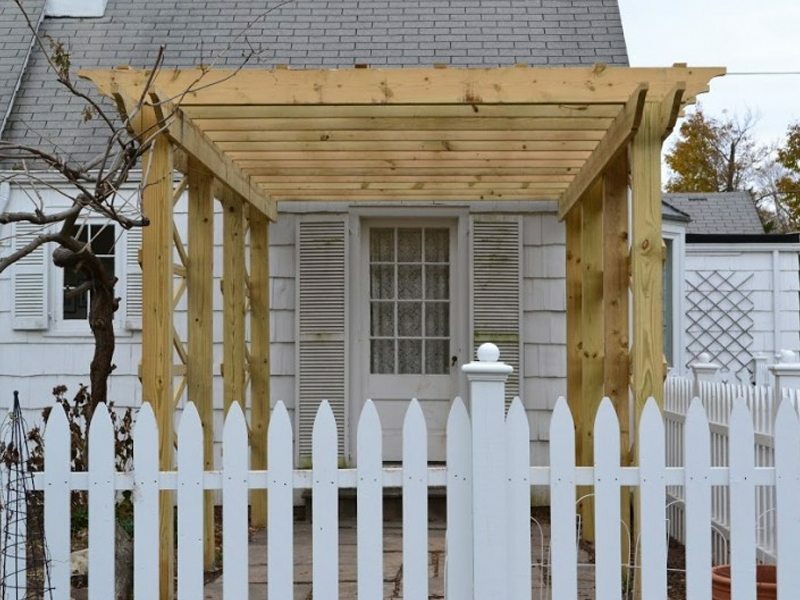 These Madison, NJ 07940 homeowners already had a beloved pergola in their backyard. However, years of exposure to the elements had left it very rotted. The pergola was so damaged that our carpenters deconstructed, and reconstructed the entire structure. In only 5 days, these homeowner’s had a new pergola, modeled exactly after their original. Our carpenter’s in Madison rebuilt this pergola from the ground up, beginning with new concrete footings. First holes of the proper depth are dug to be filled with cement to set the structure’s new footings in. Concrete is poured into the newly dug holes. These footings, like every other aspect, were modeled after the original structure. All measurements were taken to ensure that this new structure would be an exact replica. Each pergola is unique. For example, the pergola at this home had a large open center panel; a walk way of sorts. It was important that our team perfectly replicated the original so that the center could be open again as a walk way. An extra challenge presented to our team was how to go about the restoration without disturbing the tree that the original pergola was supporting. To support the tree during the five-day building time, a temporary support structure was built. This tree was kept in mind in every aspect of the building process. Not only was this custom structure built to support the tree, but when the footings were put in our carpenters also had to make sure that they did not hit, or disturb the tree roots below in any way. This pergola was built with pressure treated lumber which will help ensure it can handle many years of exposure to harsh elements without rotting like it’s predecessor did. The entire structure was hand-made, with custom cut pieces to match the home’s original. Here we see a Monk’s carpenter cutting one of the pieces of lumber to its custom shape. As the new pergola grows the support tree must be incorporated into the structure. The homeowners emphasized how important the well-being of this tree was, and our team at Monk’s really took the time to make sure that no harm came to the tree during the building process! After only five days, this pergola renovation is complete! Well, it is missing its final paint job. The pergola was completed in the week before hurricane Sandy. Due to the weather, we were unable to paint the structure upon completion. However, the pergola has now been hurricane tested! It was given a final paint job in the Spring. The homeowners were very happy with the outcome of this project. Not only was the entire pergola replicated, but the tree was not harmed, and now has a brand new structure to support it! More Projects: refinishing flooring gallery. If you are considering building, or restoring a pergola we would like the opportunity to tell you why we think we are the best contractor in Madison, NJ 07940.